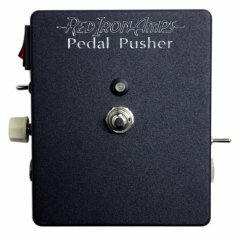 My first pedal is called the Pedal Pusher. 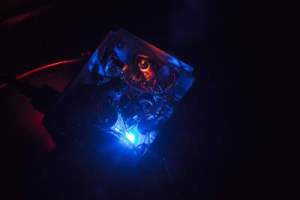 It uses a sub-miniature tube with a full voltage power supply. The first stage gives a slight gain boost with volume and tone control. The tone control comes in the form of a 3-way tonal switch: “UP” is full-bodied w/gain boost, middle is uncolored with compression, and “down” is bright with a slight gain boost. Why the Pedal Pusher? Because one of its primary uses is in front of your pedals or pedal board. What is unique about that? You know we all love the organics that tubes provide. How about driving your pedals with a tube-infused guitar signal?! and, because the Pedal Pusher has a buffered output, the loading effects of all that interconnecting cable will be lifted. The high end sparkle that was lost is now restored. I have found that my pedals take on a tonefully different character. They like being driven with a low impedence signal. And my ears like it too! When not needed (really? ), you can go into seamless true bypass. Notice he runs through all the various functions. Now, Jason has the prototype. In the subsequent versions we’ve switched things around a bit more to make it more logical/ergonomic. The Pedal Pusher is point-to-point wired. The tubes are run at real world voltages (not starved-plate). It will work as a DI for you acoustic players (and take that clickiness out of your attack). It will transform your passive effects loop into an active one. Customization is available. We also include a ground lift switch for THOSE venues. Read our review from Steve at Collectible Guitar.